On simplicity redefined and slowing down. In my new mantra to learn to let go and embrace the ‘imperfection” that I am defining myself and my life of late, I am also redefining simplicity. After months and months of feeling overplanned, too busy and not even the ‘good busy’ kind of busy, I had it. I declared getting back to basics and uh, simplicity. And paring back how planned I’d become, and prioritizing plans and making a pact with M that we always run plans that involve each other by each other before committing (this was key – we kept planning on top of each other and it was frustrating! seems like a no-duh, but clearly we were not doing it, or doing it enough!) really really REALLY helped. I felt less stressed, less rushy, and happier, generally. 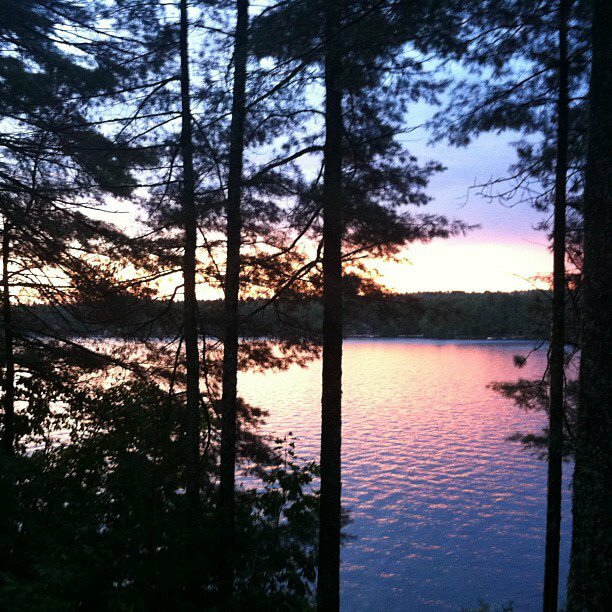 But this weekend, in Maine for ‘#lakation13’ part two, I came upon a realization that my definition of simplicity was again changing. Well, let me rephrase that. My definition of simplicity and my feelings towards ‘busyness’ have shifted a bit. I go into this next ‘season’ of my life with the believe that simplicity means paring back my commitments but it also means prioritizing my commitments to those that matter most to me…and that may again feel like a ‘no-duh’ statement, but I was feeling myself shifting towards ‘planless’ er, planning to mean no plans. And that’s not what I wanted to do. I wanted to just make sure whatever I do, I do it because I want to, and if that means it makes a certain timeframe busier, with all of the other things that I may already have on my plate – work travel, meetings, barre n9ne classes or events, things like that, that I don’t shy away from plans with someone I care about ‘just’ to not be busy. That feels silly and somewhat counter-intuitive. Yes, there are times to say ‘no’ because there simply isn’t enough time in the day, but to almost automatically say no because you have something else going on that day, weekend or week? Not the same thing. 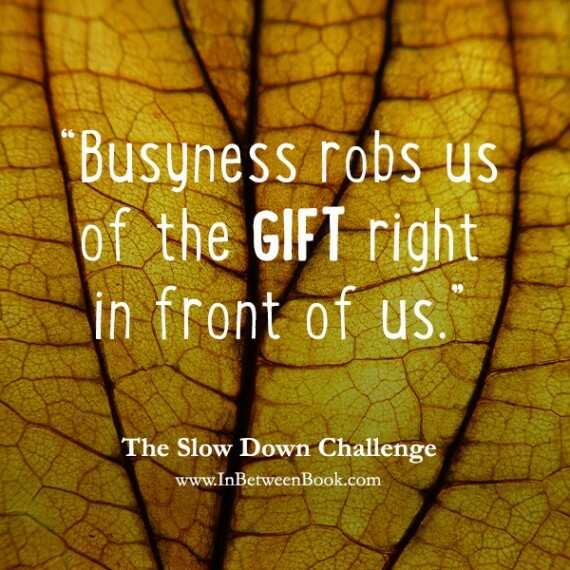 This realization came in part because of the Slow Down Challenge that came at just the right time. A challenge my beautiful friend Lindsay forwarded to me, and wow, was it right on. Every single daily message and challenge has been bang-on. It’s as if the writer – Jeff Goins – is writing this just for me. Legit. Every work. For example? Multitasking and jamming everythingthatcouldpossiblyfitintomydayandbyGodiwilltrytofititin. Hi – that’s totally me. And it’s robbing ME of the goodness that lies in focusing on the here and now, the conversation I am having, the meeting I am in, the quiet time I am savoring with M after work. It’s something I am working on, but it’s also something that is easy to let slide when life gets busy. But that shouldn’t be an excuse and that is why I really just need to keep focusing on that. The here and now. Not this, that and the next. Right. Now. 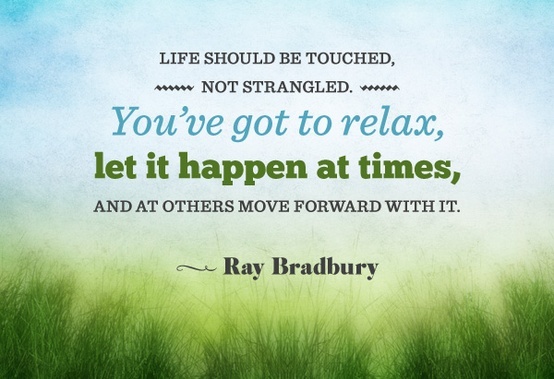 …focusing on the here and now. Awhile back, I waxed poetic blogged about it being ‘finally effing Friday’ (hello longer than LONG week and chock to the brim with activity!) and today? It feels warranted to celebrate FEF yet again. Because it’s been another doozy. Mostly in a good way. Just one of those weeks where I felt like M and I were ships passing in the night (we had one meal together this week, and tonight won’t even have that!). And not even so much because I fell back on my motto to simplify either, just a week where M had lots of meetings after work and I had several evening plans as well. But in the choas of this week comes a few very fabulous things I am loving. So, celebrate, shall we? I am loving sister dinners. 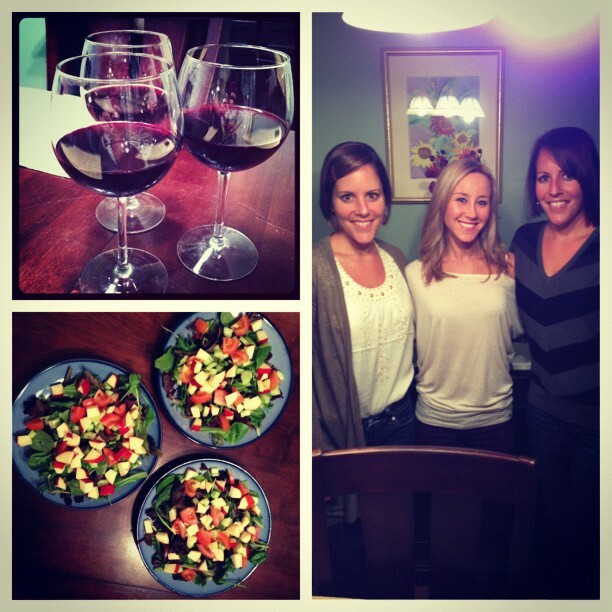 As part of my quest to make more room in my life for what matters most, sister dinners was a top priority. These nights are so special and NEEDED for the three of us, to really connect as sisters, without our men, or families, or anyone, around, just us. Being silly. Sharing in a glass of wine (something my sister Jen rarely gets a chance to do!). Laughing. Venting. Catching up. 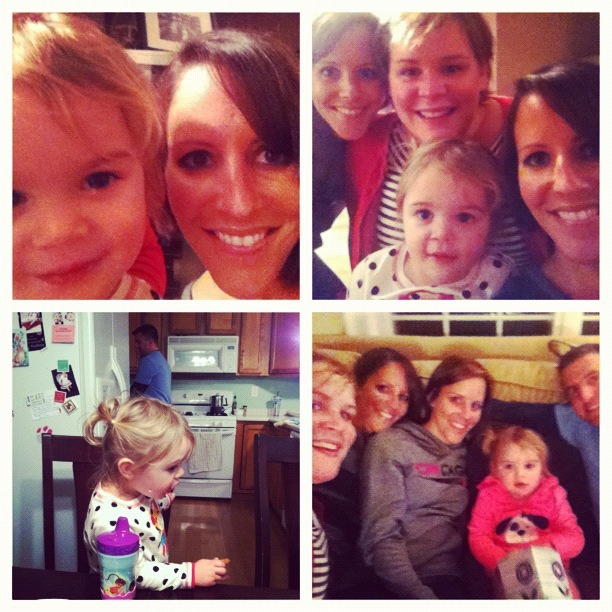 Sister dinners…worth the busy week to cram in and do right. I am loving my expanding role in barre n9ne. Another reason my week was so busy – but in a valued, good way (just so happened that everything got planned for the same week, M’s busy week and mine, the perfect storm for ships passing in the night! ), was a long-awaited meeting of the b9 minds (LOL. That would be me, Jess and Tanya) to discuss even more ways to make barre n9ne better, bigger, and stronger. My sister and I are officially taking on more of a marketing/PR/social media role at the studio to help make this happen and I couldn’t be more excited. Melding my passion with what I’m good at (PR/social media)? Perfection. And, helping even more with the 60 day challenge, refining it further, helping clients be successful? A dream. Bringing in new events, features, and classes and teaching even more? Words cannot describe. And, I am loving looking back at the past four (!) years since I began my journey anew. You see, Tara at Relative Evolutions asked me to write a guest post for her on my evolution, from then, until now (she’s had quite the journey herself, and I am so proud of her, and happy to see where she is now!!). And it’s taken me weeks and weeks of ruminating on just how I wanted to capture it, and the inspiration to put it all together. Here is the finished piece, and I am so proud of it, and my journey. I don’t write on the topic nearly as much, but it just makes my heart happy, proud, and filled with gratitude about my life now. So, while I am celebrating FEF fervently today, I am feeling grateful (albeit relieved the week is nearing an end). And I am feeling so fortunate to be surrounded by those I care about. Because this weekend? It’s Friendsgiving, folks. Third annual, and it’s going to be the best one yet 😉 Hope you have a fabulous weekend, shaking off a long week, and enjoying a much deserved weekend! Cheers! It’s been a few weeks of reallyreallyreally focusing on simplifying. Everything. Life. My schedule. My workouts. Every.thing. And I just gotta say, I already feel so much more at ease, more relaxed and with more time. Not even literal time so much as time to breathe, observe, notice things that I wouldn’t if I were crazily jumping from one planned thing to the next. Like when M hugs me extra tight on his long days at the office (Tuesdays, when he gets home after 8), or the ability to really focus on putting together a ‘refreshed’ b9 class with just a few teeny tweaks that sometimes make *all* the difference (I always change my classes up, everysingletime, but taking time to step back and do something just *slightly* differently has felt like a treat!). Or looking at my calendar for the weekend and realizing I don’t have ONE thing I HAVE to do. Just stuff I *want* to do. This weekend was BLISS because of that. One of the most fun, fulfilling, enjoyable weekends in a long time. A month ago, I felt jammed into a corner and overscheduled in every sense of the word. And the worst part was that I did that to myself. Nobody did it for me. I realized that I was making plan after plan, I was the one taking that initiative and I guess, taking the initiative perhaps a wee bit too far and not prioritizing enough. I was shortchanging life by trying to do too much. Counterproductive, much? And as I sit here thinking about the things I want to do, that I’m inspired to do, it conjures up all sorts of other things I’d love to fit into my life naturally, with the freed up time I have (and no, not to then go and overschedule myself again!). See the friends that mean the most to me. Make my workouts as intentional as possible, not out of ‘have to’ or ‘need to,’ continue to expand my repertoire of yum foodie creations with my latest obsessions – lentils, butternut squash, dates. (pinterest, come to me!). Finish that book I started in Mexico. See my sisters regularly (check! sister dinner this week and hopefully becoming a weekly or bi-weekly thing ongoing). And, plan that marriage I keep ruminating about. It’s sad to me that I was so scheduled that I was missing out on things that I most wanted to do. And I never really want to fall into that trap again. Who’s with me on this quest for simplicity? Join me, will you? Do one thing to simplify your week this week, or conversely, DON’T do one thing to simplify your week this week. What is it? Ever look around and think that somehow, life has gotten more complex, too busy and far too complicated? I’m working hard on one of my ‘year of 32’ manifestos. Simplifying my life. And what have I realized so far? I’ve realized that being over-scheduled is far worse than having no plans. I’ve realized that sometimes friendships blend into acquaintances…and that’s okay. I’ve realized that this ‘friendship evolution’ means more time for the ones who truly care and who you truly care about. I’ve realized that taking a step back, looking around and finding ways to pare back makes me happier than trying to fit it all in. I’ve realized that one focused goal are better than five broad ones. I’ve realized that meals with 5 ingredients or less are almost always far more satisfying than complex ones. I’ve realized that overthinking clutters my brain, messes with my mood and distracts me. The opposite? Frees me. I’ve realized that running can be just that. Running. Nothing more. Not scary. Not a struggle. Simply a challenge. And I’ve realized that most importantly…less is always more. 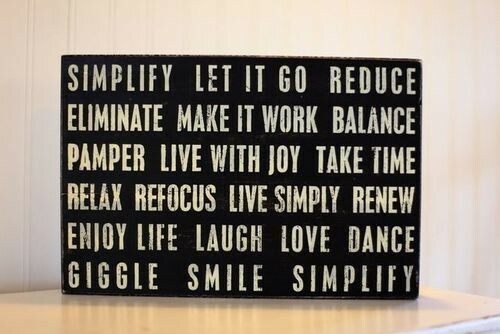 What would you do to simplify your life?